The Minnesota Forecaster: Winter Dead: Severe Time in the Cities? Winter Dead: Severe Time in the Cities? It finally seems safe to declare winter dead. Just as last year, it seemed to last forever, defying an ever-increasing direct sun angle. 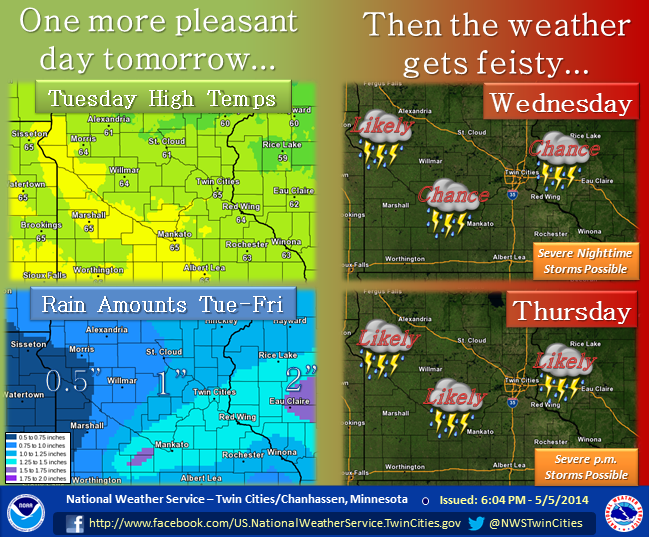 With warm weather finally easing its way this far north, the threat of more than garden variety storms seems possible later this week — or "feisty" weather as our local NWS office calls it. 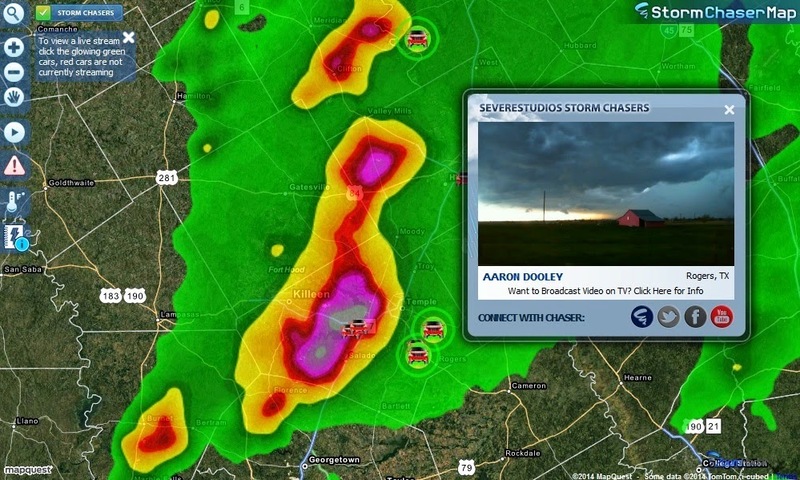 For the storm-chaser inclined who lack the opportunity or resources to head out in search of nature's violence, one option is to check out ZoomRadar/Severe Studios, which has an interactive map of storm chasers streaming live video from their dashboard cameras. In theory, you can recline in your favorite chair watching the Twins while virtually being in the car with the storm chaser of your choice by watching your computer or favorite mobile device. A cool concept, and one that may just come into play later this week. Also, for those of you are weather bloggers, it's something you can easily incorporate (for free) on your sites. Thanks for setting this up, Bill. I enjoy learning about the weather in more detail during each of our seasons, and while the blog seems to focus on winter, perhaps the gurus will help us understand more about this season and its variability/volatility, too! Again, thanks for this post! Appreciate the feedback. Thank you! Bring it on!! A lot of us muddle thru our horrible winters so we can savor the great thunderstorms we get! 30% hatched risk for central and southern MN and a part of western WI issued by the SPC for Thursday. Be monitoring the skies on Thursday, because if there are breaks in the clouds and temps warm up a lot, it will be a pretty active afternoon and evening. Overnight/morning storms are expected, but a lot will depend on how quickly they move out. All three modes of severe weather will be possible (hail, wind, tornadoes), especially if we clear out. Discussion also mentioned possible upgrade to moderate, if morning storms don't mess with things too much. Be safe everyone. Wow, model data coming in HOT for severe tonight & THUR. ECMWF has CAPE of 2000+ jkg with strong southerly low level flow. Also places so. MN & western WI on the nose of a Jet streak by Thur PM. 'Triple Point' & Mid-level dry punch likely to trigger severe outbreak by 3pm or so & continue into the early evening. I won't be surprised to see SPC upgrade to Moderate risk for THUR with their am outlook. Severe thunderstorm watch has now been issued, including the TC Metro area. That cell near Mankato has been forecast by all models, now the question is will it go tornado warned or not. Storms near Mankato are fading. But storms near St. Cloud are erupting. Just watched the video, nice job guys. I noticed that Tom mentioned a possible dry slot, and that has been advertised by the NAM model. The only problem with that, it's the only model out of 8 that I looked at last night that showed that. The 05/07 18z run has now started to fill that in. Tomorrow looks very interesting indeed, as both the 18z GFS and Nam forecast soundings show a loaded gun, with a trigger to set things off. For tomorrow night. This is a map that shows one model output for significant tornado ingredients for Thursday night over the metro. This a hot link so it will change. Far southern Henn county now in a severe thunder storm warning, lets see if it holds together. Hot links, didn't save these to a photo sharing site, but the new day one outlook has been posted. General risk has gone to Moderate. stay safe everyone, know your escape routes, if necessary use them. The hatched areas...ie: the black lines means the risk could include significant severe. Meaning tornadoes of EF2 or stronger and hail greater than 2"
Can't wait to see the 18z MSP sounding & hodograph. Too much overcast for widespread severe weather?! If that's the case, we'll have been foiled again by clouds, and this will have been a major bust. They've been talking about today's weather for the past week. Storms currently over srn MN are not the significant activity which is expected. If it occurs, it will be later this afternoon into evening. Gimme a B! Gimme a U! Starting to call bust when they are specifically saying "hey these storms aren't the threat, that's later" ??? Huh? Yea, today has bust potential for sure and we all have to wait and see how it plays out, but starting to call it based on that tweet makes absolutely no sense. Sorry, I guess I read it differently than you did. It's not worded very well. A watch (or two) will likely be issued soon. I am sure things can still happen, but it doesn't seem that organized. Many ingredients, but maybe not coming together in an organized way. You maybe tracking severe weather/tornadoes today, but whos tracking the FROST potential by midweek next week. Low temperatures look to fall into the 30's for a few nights. Only in Minnesota, one extreme to another. Pretty sure average last frost date in metro area is May 10, so it's not that odd to see temps that low next week. May not be odd, but it will be beyond average by almost a week! Thats a big deal with every garden center bursting with plants. Well, areas that saw sunlight saw severe, but overall things didn't pan out the way the SPC thought. For the record, everything was conditional on seeing sunshine and heating (as is always the case) and they were pretty clear about this in their discussions. If we had warmed into the 80's today and saw more sun, this would have been a pretty big event. Several cells did try to get a spin going but they really struggled to become established. There was at least two confirmed tornado reports, but I haven't heard much in regards to damage or injuries. In my opinion, things started looking less optimistic for severe storms last night. It started with the convection that fired ahead of the northward advancing warm front. Often times when there are a lot of storms ahead of a warm front, it can disrupt its movement and stall it out. This happens all the time. For days, models had the warm front lifting well north of the metro by this (Thursday) morning, putting more of southern MN and WI well into the warm sector. I was watching that front last night and when it became stationary it was an immediate concern. I was holding out hope that the front would make a big surge north during the day, but again it didn't happen. Cloud debris was the other issue. It looked like for a bit that the clouds would thin out, but things started firing pretty quickly in southern MN which just added to the cloud cover. Like all storms, it takes the perfect combination of things for the big severe weather events to happen. Remove one thing, and it can throw everything for a loop. While strong storms did form and do damage, really things could have been much much worse today. Duane, thanks for this explanation to help me better understand these potentially-volatile weather patterns. I am very thankful that 'what happened happened' and it is nice to begin to understand the how and why of it all. Sometimes I think spring/summer storms are harder to predict than those snowstorms, but that is just a hunch. As an armchair meteorologist, I was hoping that we didn't get up to the high temps predicted because then, yes, it could have gotten worse out there. Randy/Novak and other weather gurus may chime in, too. Thanks again, Duane. I am again glad that Bill set this up for the discussion at this time of year. I was disappointed with yesterday's weather, especially since it appears we're headed right back to our hideous non-Spring. In retrospect, the tornado watch was excessive. Duane is right that their early morning discussion talked about the sunshine factor. But the watch was issued around the time it became clear that there wouldn't be a decent amount of heating. The metro area didn't see much in the way of anything severe, let alone a tornado. In fact, it Wednesday night's storms were more impressive, at least in terms of hail. A couple weeks ago, the SPC did a stellar job forecasting the huge tornado outbreak across MS, AL, etc. But their severe forecasts for MN seem to be prone to busts. I wonder if it's trickier to forecast thunderstorms in this part of the country. Let's hope it finally warms up around here so we can get some decent summer storms!! @Disco, why does it sound like your rooting for severe storms. All modes of severe storms bring the potential of damage to property, be it hail,wind or tornadoes. To me if we get rain and thunderstorms without them becoming severe its a win-win for everybody. Lawns and plants get free watering and the public doesn't have to worry about clean-up or damage from storms. So heres to hoping we don't get the storms that Disco is yearning for. Oh and I hope the frost potential stays away as well because I have planted all my plants already! You're dang right I'm rooting for severe storms because that's the weather I enjoy. And I'm not apologizing for it. This is a weather blog. As for clean-up or damage, winter storms cause far more problems (and missed school, lost productivity, increased insurance costs, DEATHS) than any summer weather we get. So whatever. Your a moron, I hope the next time storms roll through here they hit your city with a tornadoes, the roof of your house is gone and a tree falls on your car. God forbid a love one of yours passes because of it. Sorry for the personal shot but if your rooting for it I hope you get it. I second that @Anonymous(7:24) your a moron. Two reasons for it, one for rooting for severe weather to hit in our area and two your statement above lacks research, since 1986(when fatalities for winter weather started to be recorded) there has been 2,261 deaths in the US due to tornadoes and 1,080 deaths due to winter weather, furthermore those deaths are just tornadoes, it increases dramatically if you include other 'warm weather' events like hurricanes, floods, lightning, and heat. So your above statement that winter is far worse is very inaccurate! Advice to you: don't park near trees! Thats awesome @Tim, thanks for the research and putting Anonymous rooting for severe in his place. Why on earth anybody would want severe weather to hit is beyond me, I mean I appreciate @Duane and @Novak and @Randyinchamplain for their weather knowledge and analysis/prediction but I don't feel like their rooting for it, I feel like when I read their posts its more of a heads up. I feel the same way about snow. I have no idea why anyone would root for that. To each his own. I'm late to the party here, so I doubt this will get read, but as a weather lover, I felt I needed to respond. I'm a weather lover, which means that I want to see what nature can do. That of course means extreme weather of any kind. It's endlessly fascinating. Do I want to see homes and property damaged or destroyed, or people injured and killed? No. But when the conditions are right for dynamic weather, I'd prefer that it actually happen, much like Anonymous above. Busts are a major disappointment, especially when it comes to the chance to witness something impressive. I honestly don't understand someone having an interest in weather that doesn't want to see what can happen. I mean, how boring would it be if we got exactly as much rain as we needed each and every day? Or if we got our regular seasonal snowfall in 2-3" increments? I don't wish disaster on anyone, but I do want to see what this fluid atmosphere of ours is capable of. Late weekend looks scary for places to our south. Iowa, Missouri, Nebraska, just to name a few, could be looking at quite the regional severe weather outbreak on Sunday. Powerhouse warm front sets up down there, with a nice deepening low along with it will create a pretty dangerous set up down there. Depending on how things play out, don't be too surprised to not only see a slight risk for severe close to the southeast corner of MN on Sunday, with a pretty widespread moderate risk area near the Des Moines area and strong wording by the SPC in regards to this potential event. Monday will probably be the next day that maybe a severe threat gets close to home, but I'm not holding my breath at this point in time. I have my doubts but you just never know with nature. The central and southern plains will likely see a very active end to the weekend. Funny....just read the NWS discussion and the thermal profile by midweek supports snow, but they are leaving it out of the forecast. Middle of May and snow is STILL possible, regardless if it happens or not it just means weather is on the cool side and thats just fine with me.....the longer we delay the heat the better, because we all know heat index weather is around the corner. After this cold spell both the GFS and the Euro are strongly hinting at a omega block setting up, ie trough in the west, trough in the east, with a nice ridge setting over the middle of the country, including the Northern Plains. It looks a nice warm up could be in place say around the 16th trough the 20th or so. However when the block starts to break down we could see a very active period. As the western trough starts to move to the middle of the country around the 21st or 22nd, it will run into the ridge moving slowly to the east and most likely turn to the northeast. This results in a good chance of severe weather somewhere close to home. Because this is 10 days out take it with a grain of salt, I will give about a 20% chance of verifying, but the potential is there. WCCO’s Mike Augustyniak actually used the “S” word today. He said that while temperatures would be in the range to produce snow, the precipitation probably won’t be there. I’m a life-long resident of the Twin Cities. As a child, after school was out, we started one “summer” vacation by sitting on the front porch watching snowflakes… MM ;-) P.S. For as chilly as it is here, they’re predicting record 20’s where Bill is. Looks like he may have packed a little Minnesota cold when moving to CA. Hmm... where in CA did you see 20's? Or did you mean 20's in celsius? Supposed to be 102 tomorrow where I live, 30 miles east of San Francisco. That will be right about a record (typically high of 77). Okay, apparently the weather here has affected my brain (plus too many deadlines this week). I read that as 120 not 102. 120 would be record setting in CA, 102 not so much. So I’ll rephrase my question…which do you prefer 102 or -2? I'll take 102 100 times out of a 100 over -2. Especially, the 102 out here, which is very dry. It always cools off to near 60 even on days when it hits 100 during the day. Piece of cake! Accuweather is showing 80 to 88 Friday to Monday of Memorial Day weekend. Intelicast and TWC show 70 vs 80 for Friday of that weekend. That's all the farther ahead they forecast. Who will end up being closer? Average high for today is 70°.....current temp is 49°, Im sure I won't make any friends with my next comment but........I love it. I have never hidden my love for weather to be on the cooler side of things, why start now! We have been on or above average only 3 days for the month of May and won't see average till maybe Sunday, looking out for the rest of the month(last ten days or so) it looks like we will run near average to slightly above most days, keep in mind average high by the end of May is around 78.....looks like May will continue our below average month streak going, are we up to 8 now??? All good things come to an end.......first 80° high in nearly 7 months.....the damn "muggies" are back! Hey first time poster. I'm down in Northfield where an hour ago it was 81 degrees and the dewpoint was 61 degrees. Now we're at 88 degrees with a dewpoint of 50 degrees! No thunderstorm occurred but it did change from mostly cloudy to mostly sunny. I've heard of dry lines down south but is that what happened here? Can someone explain this change? You can use this link to see the Flash Flood guidance, you should be able to see 1,3 and 6 hour rainfalls that could cause floods. At one time I thought I found a higher resolution map, but haven't been able to find it again. If any one can find it please post. With the Euro total precipitation through the weekend into Monday I can see why MPX is so concerned. Can't show the Euro totals, but it has been rather consistent at showing a widespread swath of 3-5" of rain. What it doesn't show is the rain that may fall along the stalled frontal boundary Sat night through Sun as the resolution of the model can't show individual cells. I would expect that where the frontal boundary sets up could see rainfalls approaching 7". I am not expecting a wide area of severe weather until the low pressure gets to closer to us sometime on Monday, by that time we should see some stronger speed shear through the column, but it should be mostly unidirectional resulting with a strong wind threat, however by that time we may loose the best instability, so confidence is rather low. Regarding hail chances, while some cells could produce some 1" hail, the freezing level should be rather high and most hail stones should start melting as the pass through the lower levels. As promised here is the link to the Flash Flood Guidance. I will add this. In order to get wide spread severe weather you need to have strong instability co-located with stronger wind shear as you move up the column, so far it's not there. I believe that the heavy rain scenario is a slam dunk over the next 48 hours. The concern for widespread 2"-3"+ rains is valid & I would expect some flood warnings to be issued by Sunday night. On the other hand, I'm surprised that the SPC isn't more concerned about a severe weather event for portions of the Upper Midwest, including so. MN (MSP), on Sunday. Model data is not showing much strengthening in the wind fields with their overnight runs, but I believe this is being underestimated. All model data shows an obvious disturbance tracking NE out of the Plains & into the Upper Midwest on Sunday. This should be the catalyst for increasing shear & helicity (twist) in our atmosphere. If we can get some sun over so. MN Sunday, watch out. I can't imagine this evolving into a major widespread severe weather outbreak, but I do believe that the conditions are warranted for at least a SLIGHT RISK mention from the SPC. I will be shocked if a few warnings are not issued for so. MN later Sunday, esp. in the evening hours. Using the GFS instead of the Nam, I just don't like the way the Nam initialized, at 06/01 0z it didn't show any precip over the metro at 03z, that obviously was not correct. While one would think there should be some helicity along the surface low track, the maps and forecast soundings really don't have any support above 850mb, at least near the metro. Its hard pressed to find wind fields above 30 knots between 700 and 500mb.